For most of my career, I’ve been a tireless advocate of a single investing principle: that stock prices ultimately follow earnings. By that I mean if a company continues to increase its earnings quarter after quarter, its stock price is bound to trade higher, too. And vice versa. My faith, mind you, is well founded. Ironclad studies demonstrate that the price performance of the S&P 500 index does indeed track profit growth. As a result, I consider earnings growth a reliable leading indicator when evaluating stocks. But more and more, I’m becoming convinced that an even better leading indicator may exist — patent filings. Before a company can book a single penny in profit, it needs a product to sell. Yet in today’s fiercely competitive global economy, before a company can produce something to sell, it needs to patent the idea. Otherwise, it’s too easy for competitors to knock off the product and steal market share. In other words, being first to market is no longer enough of a competitive advantage. Companies need to be first to market and have patents protecting their products to ensure sales and profit longevity. Groupon (GRPN) and Apple (AAPL) serve as good examples of this new paradigm at work. As you’re well aware, Groupon invented the daily deals market in 2008. All it took was a novel idea to connect consumers and businesses in a new way — via coupons over email. Groupon didn’t have even one patent protecting its novel business model. And within four years, over 300 competitors emerged. Now Groupon doesn’t stand a chance to keep booking higher profits, let alone surviving. Contrast Groupon’s experience with the details behind the meteoric rise of Apple and you’ll definitely get the connection between patent filings and stock price performance. We can all agree that Apple took the world by storm with its iPhone launch in June 2007. Before it sold a single one, though, it secured as many patents as possible. And it continued to do the same thing on every next-generation device. So what happens if we chart Apple’s patent filing activity against its stock price performance? 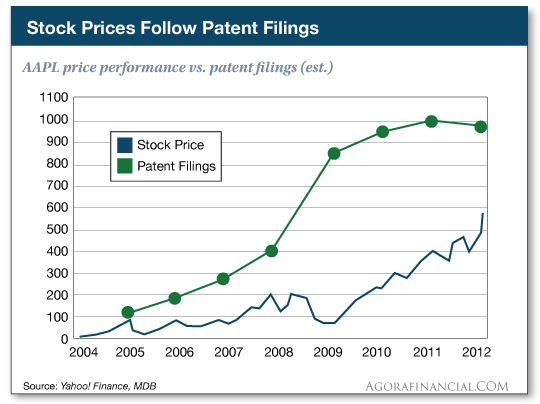 As you can see, the number of patent filings increased significantly before Apple’s stock price increased significantly. The uptick in patent filings signaled an uptick in innovation at Apple. And the patent filings proved to be a reliable indication of new, potentially game-changing products in development. Once the products hit the market, their market potential was realized, which showed up in increased sales and profits. Bottom line: While earnings growth remains a reliable indicator, we’d be well served to add patent filings to our repertoire, too. It’s an even earlier indicator of stock price performance. This week, I’ve handpicked two charts to convey Apple’s current – and likely continued – dominance. Then, it’s on to a handful of graphics that underscore the shocking disappearance of market volatility in a time of so much political uncertainty. Is it time for investors to rejoice or run for cover? While stocks generally cool off seven days after a Fed rate hike, small cap stocks – particularly, value names – are actually among the best performing stocks when rates rise.